Hosting the 30th Nation’s Capital Feis successfully requires volunteer support from the whole O’Neill-James community. Your time is appreciated and essential -- and volunteering is an unparalleled opportunity for newcomers to the world of Irish dance competition to learn all about the details. However, hosting a feis can also put competing demands on the time and concentration of parents and dancers. To prevent conflicts, the stage/volunteer schedule coordinators take on the duty of assigning volunteers to specific shifts after the stage schedule is finalized. This is critical to ensuring that no parent or dancers is put in the position of having to choose between preparing to dance (or helping a child prepare) and volunteer duties. This also means that volunteers do not sign up for specific time slots, only for tasks or roles on a particular day. The paper sign-up sheets and this SignUp Genius registry indicate the general blocks of time when volunteers are needed for a given task (from 2 hours to all day). It might not be intuitive, but asking volunteers to sign up for a task rather than a time is the best way we’ve found to avoid scheduling conflicts. If you already know that you will not be available for parts of days, please let us know when signing up. Don't worry: you are signing up for a shift, not for the whole day! Most activities will take place at the ONJ Studio (6406 16th St N, Arlington, VA 22205) or at the Sheraton Premiere at Tysons Corner (8661 Leesburg Pike, Tysons, VA 22182). If you have any questions, please email onjprivatelessons@gmail.com or lovencfeis@aol.com. Thank you! 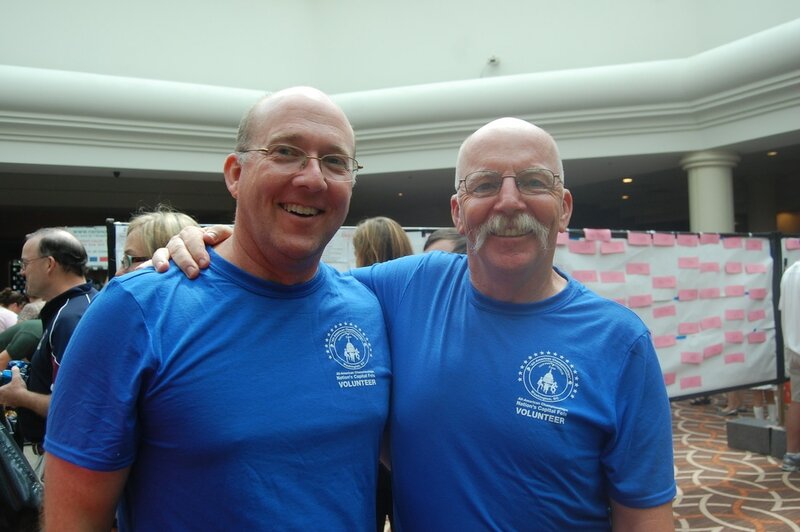 "The Hair Brothers" long time NCF volunteers and friends!